Before there is peace, blood will spill blood. New territory brings new troubles for the fierce cats of the warrior Clans, who are still uncovering the secrets of their new home around the lake. Dangers they have never faced before are lurking in the twilight shadows, and former allies are acting strangely hostile. As divisions between the Clans grow deeper, Firestar's daughters face troubling decisions. One is torn between loyalty to her calling and a forbidden love, while the other struggles with her best friend's betrayal and the surprising perils of the forest. The choices they make now could affect ThunderClan for generations to come -- and with an unexpected enemy preparing to attack, their courage and strength will be needed more than ever if the Clan is to survive. Action, heartache, trouble, and triumph. I can do without the music between the chapters though. Love the book all the way! It was great like its should be. What made the experience of listening to Warriors the most enjoyable? The story is unbelievably well told.I am 13 years old and I listen to it every night and it comforts me into sleep. Which character – as performed by Nanette Savard – was your favorite? 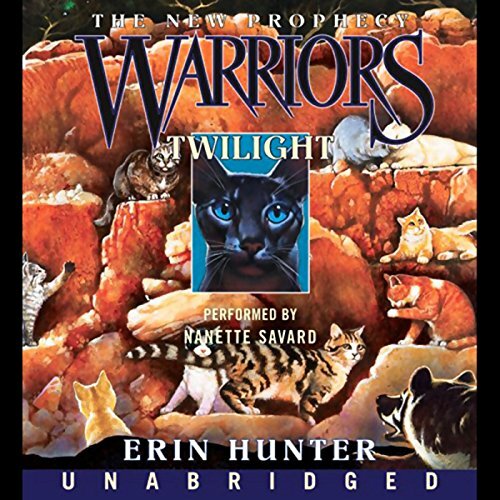 Would you consider the audio edition of Warriors to be better than the print version? Nanette Savard, I freaking love you. Your awesome. I love this series. So the book just came more to life with you. Very good book, very good Narration. Leafpool, she has this connection with me. What about Nanette Savard’s performance did you like? He ability to change her voice for every cat, and use it the same over and over. Great story great voice. Never heard a better audiobook! Couldn't be better absolutely awesome if you like cats then this is perfect!